If any washer does not work or the low windshield washer fluid level warning light comes on, the washer tank may be empty. Add washer fluid. 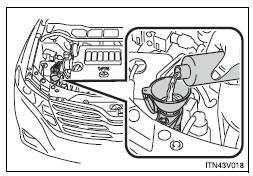 Do not refill the washer fluid when the engine is hot or running, as the washer fluid contains alcohol and may catch fire if spilled on the engine etc. Doing so may cause streaking on the vehicle’s painted surfaces. Refer to the freezing temperatures listed on the label of the washer fluid bottle.